In spite of several companies' efforts to match web links to native apps, opening links from apps on iOS usually takes you to a web view even if you have the website's associated iOS app already installed. This is why following links to songs on Spotify or podcast episodes on Overcast doesn't automatically take you to their native apps: iOS lacks a native deep linking technology. While Apple could introduce such framework in the future, currently there's no system-wide solution that can be adopted across every website and app out of the box. Many have tried to solve deep-linking on mobile, but to achieve real support for this experience, Apple will need to step in eventually. In the meantime, Timothy Johnsen has created a workaround called Opener that uses an action extension to let you easily open a web link in its native app. Released with an initial set of compatible links/apps such as Twitter, Overcast, SoundCloud, Spotify, Kickstarter, and more, Opener allows you to avoid tapping buttons in web views to launch associated apps; Opener can automate the process by resolving links and launching them inside apps with an extension. Whenever you're in an app that can share web links with the share sheet – like Safari or Twitterrific – tap the Opener extension and you'll be shown a popup. If a web link matches a possible app, you'll get a list of choices; tap the app, Opener will resolve the link, and you'll be taken to the native version of the web link into the app. I've been trying Opener with links from my Twitterific timeline tonight and the extension performs as advertised. I was able to open Spotify links directly into the Spotify app; I went from the Overcast website to the download screen for the selected episode in the Overcast app with one tap; and, I opened links to tweets from Twitterrific into the official Twitter app. I tried with Instagram, Amazon, and Pinterest links – Opener always took me to the corresponding native view of a link from the extension, without ever seeing a web view and having to tap "Open in app..." buttons. There's a couple of tricks you can take advantage of, too. 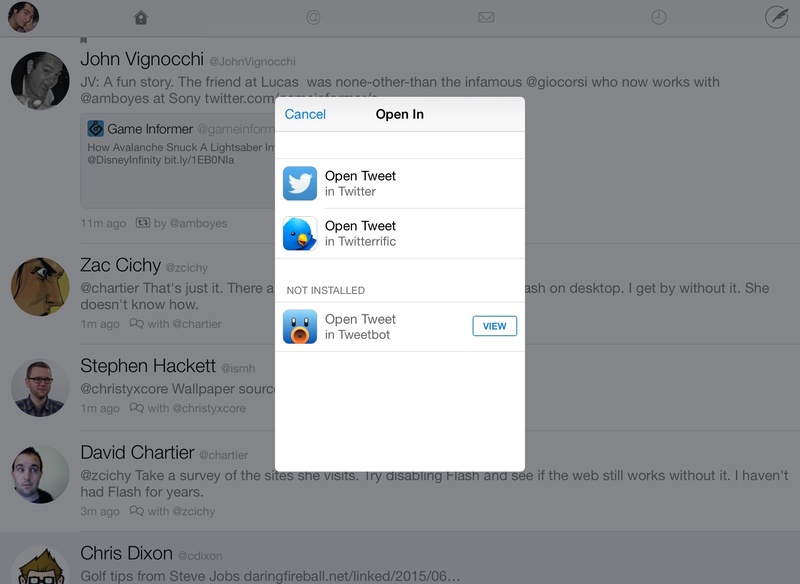 You can copy a link from apps that don't implement the native iOS 8 share sheet (like Twitter) and launch Opener to quickly open it in compatible apps. And, if you have multiple apps that can open the same domain (like Twitter clients) and you don't want to choose the app every time, you can long-tap one in the extension to give it an auto-open preference. This can be reversed in Opener's settings. There's a chance that future changes in iOS will obviate the need for workarounds like Opener, but the app works today and it can save you time if you want to open links in native apps – both official clients like Kickstarter and Medium or third-party alternatives like Twitterrific and Tweetbot. Opener currently supports around 50 apps and Johnsen is looking to add support for more soon. 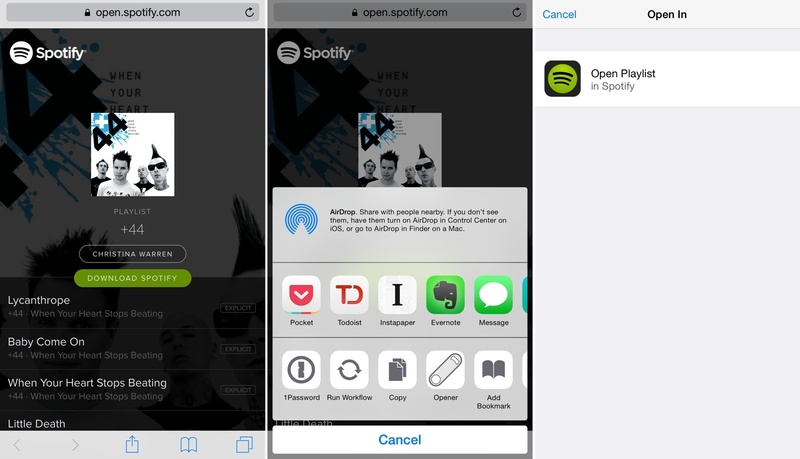 If you find yourself looking to view web links in apps often, Opener is a good timesaver that cleverly uses iOS 8 extensions to speed up the process. $1.99 and Universal on the App Store.